Through the United Nations Volunteers (UNV) programme, the United Nations Office for Project Services (UNOPS) is providing technical support for the 2019 Pan American and Parapan American Games in Lima, Peru. 40 UN Volunteers oversee the training programme, including project managers and specialists in volunteer management and training. Currently, this project consists of the largest and most diverse team of UN Volunteers formed in Peru in recent years. 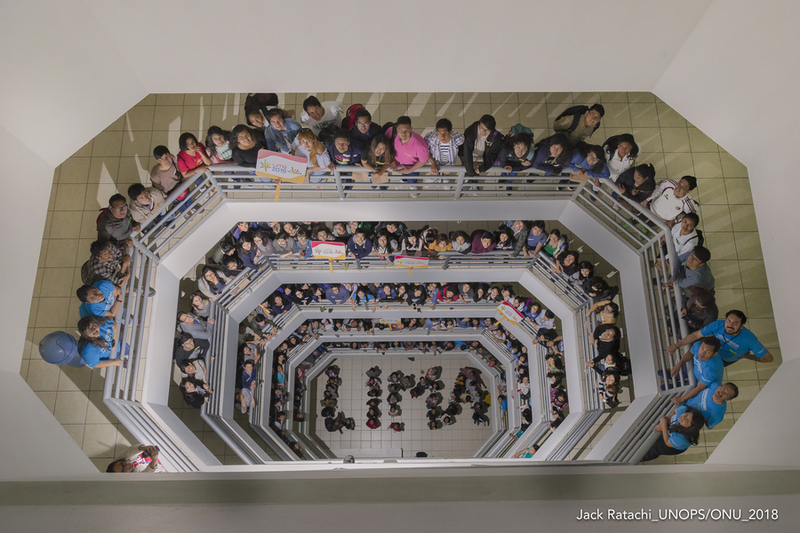 Young volunteers take part in training in Lima, Peru. The Pan American Games are considered the third largest sporting event in the world, behind only the Olympics and the FIFA World Cup. This will be the first time in history that Peru will host the competition, with close to 10,000 athletes from 41 national sports teams across the American continent competing in 39 sports and 62 disciplines. The competitions will take place from 26 July to 11 August 2019 (Pan American Games) and from 23 August to 1 September 2019 (Parapan American Games) in various venues: Lima (Metropolitan and province), Callao and Ica. In addition, the anticipated developmental impact of the games is great, particularly in areas like tourism, production, sustainable cities, etc. The objective of the training experience proposed by UNV is based on the philosophy of the Games. Additionally, there is an emphasis on the importance of interculturality, sport and development, as well as the new global agenda. In this sense, the focus is based on the general competencies outlined in the programme: participation, hospitality, and teamwork. The face-to-face and virtual training experience consists of four modules: The Pan American and Parapan American Games, Lima 2019 and the 2030 Agenda for Sustainable Development, the History of the Pan American and Parapan American Games, and Volunteerism at the Games. Face-to-face trainings are being offered both in Lima and in other regions from October 2018 until the end of February 2019, anticipating a total of 40,000 volunteer applicants in this first stage. Following the evaluation process, 12,000 volunteers will be selected for the Pan American Games and 7,000 volunteers for the Parapan American Games. Given the importance of this great sporting event, UNV’s commitment for the Lima 2019 Volunteer Programme is to contribute to the process of building the social legacy of the games. This legacy is reflected through the experience of each volunteer and their dedication to carry on this commitment in their communities and surroundings after completing their role in the event. An increased sense of awareness surrounding the importance of volunteerism as a tool to foster citizenship in their communities will empower trainees from Peru and other countries to become agents of change in society. Since 2014, the United Nations Volunteers (UNV) programme has been developing a strategy for large events, such as COP20, The Annual Meetings of the Board of Governors GBM/FMI Lima 2015, Habitat III, and COP23 that seeks a balance between the expectations of the volunteers and the requirements of the organizations. The strategy includes the development of soft skills for specific volunteer profiles to ensure that when the experiences end, volunteers increase their opportunities to become agents of positive change in their communities. Article translated from Spanish by UN Online Volunteer Laura Turner.